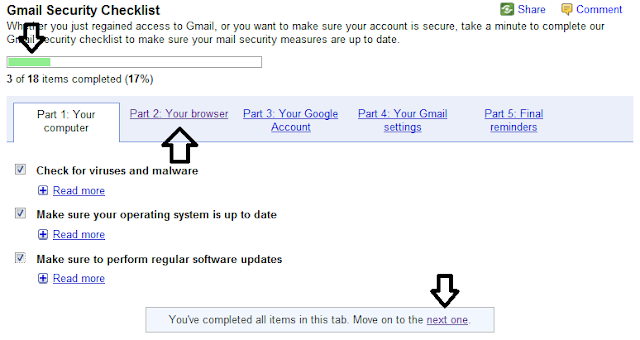 Home Gmail Security Gmail Tricks How to Security Tech Tip Use Gmail Security Checklist to make Gmail More Secure? Use Gmail Security Checklist to make Gmail More Secure? You can follow the Gmail Security CheckList to really understand the loopholes in security on your Computer and Gmail. This will be a reality check which would enable you to take corrective action if there are some serious loop holes in your Computers Security. 1. How to use the Gmail Security Checklist? 2. Just login to your Gmail Account. 3. Click on Gmail Security CheckList in Gmail Help center. 4. Once the check list loads it will give you checklist items on various parameters like you Computer, Browser, Google Account, Gmail Settings, Final Reminders. 5. Just Go on clicking each parameter as you read on. 6. The moment you are finished checking all the options in one section you will be prompted to go to next Tab. If you find out certain things which are not meeting the checklist items you need to take corrective actions to make sure the checklist criteria are met to make your mails as safe as possible. This is especially important for those people who have very confidential mails in their Inbox.